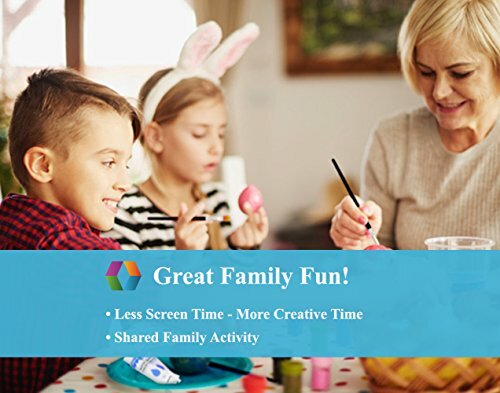 Product prices and availability are accurate as of 2019-04-09 11:53:59 EDT and are subject to change. Any price and availability information displayed on http://www.amazon.com/ at the time of purchase will apply to the purchase of this product. You might not be certain if you are more a fan of acrylic paints or liquid watercolor paints. Great news: With this complete set, you can explore both! When exploring, you're going to want non toxic, safe, odorless paints that have a smooth application and that works well with new artists and professionals from child to adult. You Get - The most COMPLETE artist studio experience for the price. Great as a mothers day gift. Let Your Exploration Run Wild - Pull out your easel to create paintings of landscapes or portraits, dense forests, flowery fields and roaring oceans. Acrylic Paint colors include: Titanium White, Lamp Black, Burnt Umber, Burnt Sienna, Ultramarine, Phthalo Blue, Viridian, Emerald Green, Scarlet, Vermillion, Yellow Ochre and Lemon Yellow. Watercolor Paint colors include: Titanium White, Black, Burnt Umber, Burnt Sienna, Prussian Blue, Ultramarine, Emerald Green, Light Green, Crimson, Vermillion, Yellow Ochre, Lemon Yellow. 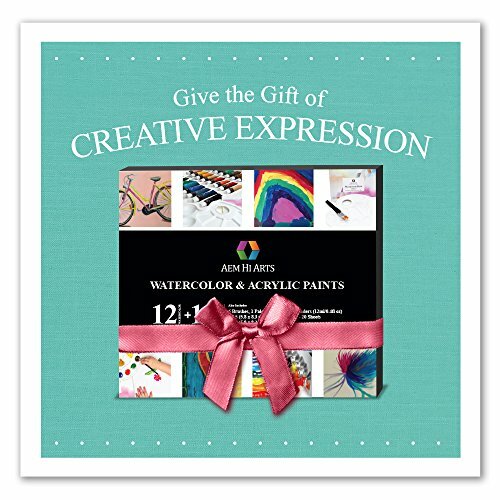 100% Happy Artist Satisfaction Guarantee - Includes free ebook: Watercoloring Basics for Beginners. Not for children under 3. 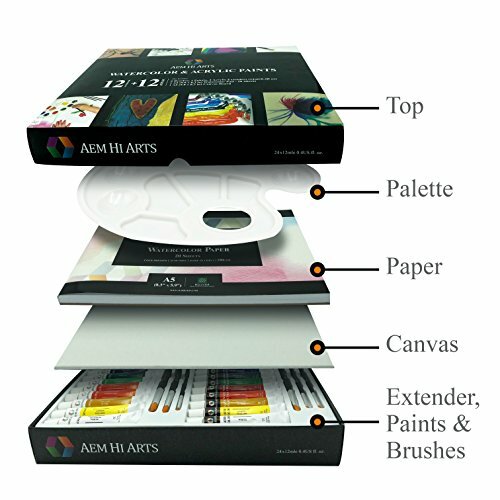  THE ONLY COMPLETE WATERCOLOR AND ACRYLIC PAINT SET FOR BEGINNERS OR PROFESSIONALS -Whether you are an adult or a child, pro or a student, The AEM Hi Arts Ultimate Explorer Set comes complete with paint, palette, 6 brushes, 2 extenders, 20 sheet watercolor paper pad, a canvas board and a sturdy kit that is portable. The paints do not have a chemical smell, will spread smoothly and have vibrant colors that will provide hours of painting joy to explore art.  YOU NO LONGER NEED TO SEARCH the internet for the perfect gift for that artistic creative explorer. 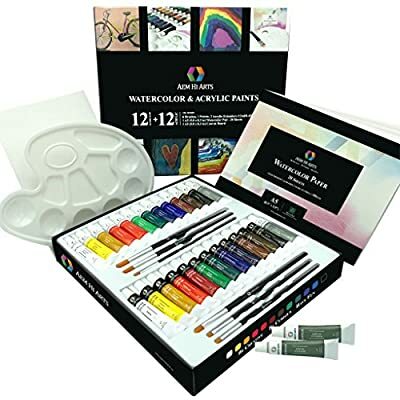 The Ultimate Explorer Set includes everything needed to explore Watercolours and Acrylics and makes for a perfect for mothers day gift, christmas gift, graduation present, Easter basket or for Halloween! Art is a powerful gift that can heal, restore, build confidence and help others find joy. The gift of art exploration can be meditative and an anti-depressant for yourself or others. 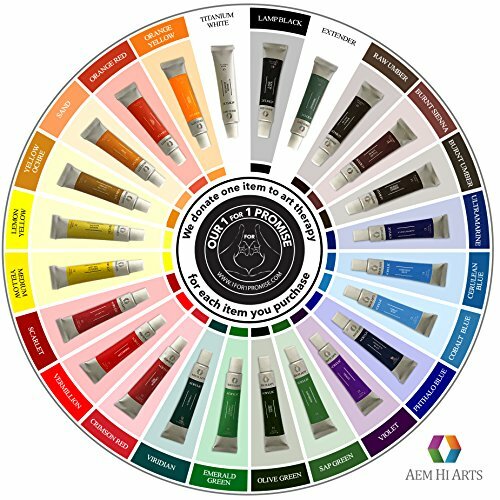  EXTEND THE LIFE OF YOUR PAINTS - The AEM HI Arts Ultimate Art Set comes with 2 tubes of paint "extenders". Blending this with your acrylic paints will double the life of your acrylic paints while keeping the brilliance of the colors. Just like using water to extend and smooth out the application of watercolour paints, Extenders do the same for Acrylics. The acrylic extenders work on many surfaces, including canvas, wood, metal, papers, cards, rocks and others. ? PROFESSIONAL GRADE PAINTS FOR ALL LEVELS - With the AEM Hi Arts Ultimate Explorer Set, you don't need to be a professional artist to have access to affordable, enjoyable and durable art supplies. We have manufactured both the watercolor paints and acrylic paints as well as all other supplies to be professional-grade. For the young and old as well as new artists and experienced artists. 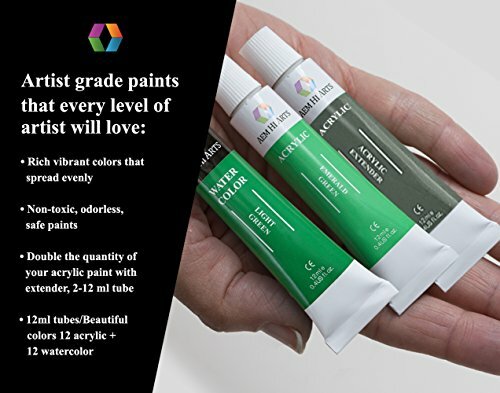  100% Happy Artist Satisfaction Guarantee - If for any reason the watercolor paint is unsatisfactory to you, our watercolor paint set is backed by our manufacturer 30-day money back guarantee with a 1-year free replacement warranty. Our paints are non-toxic, highest quality, most vibrant colors and an overall amazing experience, from ordering our product to using our paints safely. Enjoy the journey, Explore art, support our cause and most of all, Be Curious, Be Creative & Have Fun.